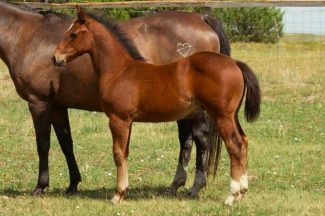 Lot 16, FA Aruba Rebel Cat, a May, 2016 bay stallion sired by PC Frosty Drifter x PC Boston Bob and out of a PC Leatherwood mare topped out at $2,100. 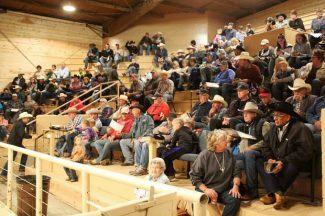 There was an excellent crowd of buyers and spectators on hand for the 17th Annual Dakota Breeders Quarter Horse Production sale. 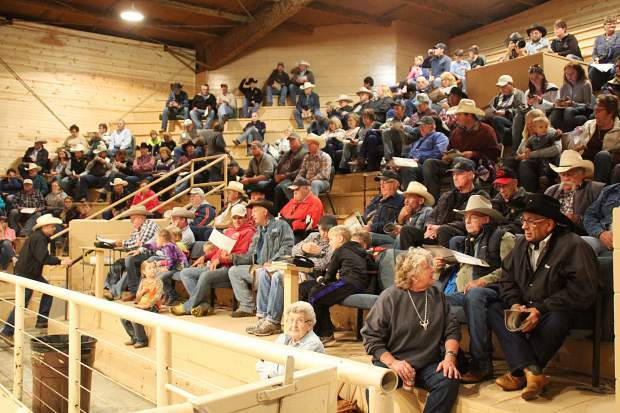 The Dakota Breeders Classic Quarter Horse production sale was held on Sept. 9 at Mobridge Livestock Auction with a huge crowd of buyers, bidders, and spectators on hand. 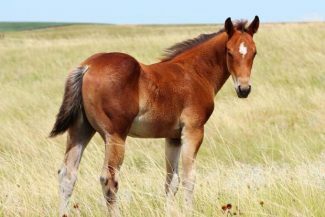 The Dakota Breeders Classic consists of sale hosts Five Arrow Quarter Horses, Broken Heart Ranch, and the DuBray Ranch. This year's guest consignors included the Eszlinger, Talebar, Ganje, and Jones ranches. The sale catalog was loaded with performance horse pedigrees from these outstanding programs and top reference sires in the nation. It was the 17 year of hosting this sale and it continues to increase in size and popularity. While adding some new names to the buyers' list, it is the strong contingency of repeat buyers that is testimony to the quality of the horses offered. In addition to offering their entire 2016 production they also offered a nice selection of yearlings, brood mares, and young started horses to make it a well rounded offering. Lot 24, BHR Bars Set High, an Apr. 2016 bay stud colt out of BHR Super Frost X Frenchmans Guy and Dr. Kirk X Easy Jet X Shaka Tail Feather mare. Selling to Dee Dee Wilking, for $4,600. Lot 21, BHR Mr. Speedy a May 2015 Palomino gelding our of BHR Super Frost and Shake it Special X Special Effort mare. Steve Kvistad was the buyer at $3,600. 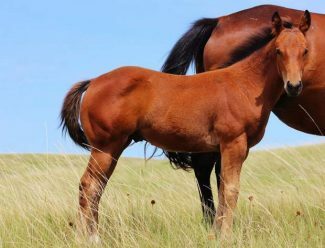 Lot 22, BHR Go Dash Go, a 2015 Chestnut mare sired by BHR Super Frost and out of a Twaynas Dash X Dash For Cash x Shake it Special mare sold to Matt Reints, Hershey, Neb. for $3,500. Lot 5, FA Nitty Gritty, a May, 2014 sorrel gelding sired by PC Leatherwood x PC Fire N Smoak x Sun Frost and out of a PC Frosty Drifter x Drop of Frost mare sold to Ross Wientjes, Mound City, S.D. for $3,100. This 2 year old had and excellent start for only 30 days riding. Lot 34, DR Irish Sparks, a Mar. 2013 son of Irish Pay x Pattys Irish Whiskey and out of a Smoak N Sparks x Dash for Perks mare. This 3 year old, red road gelding sold to Archie Hulm, Timber Lake, SD for $3,000. Lot 4, FA Bermuda Cartel, an Apr. 2016 bay stallion out of PC Leatherwood and a Pappasito x Corona Cartel, Drifts Chip mare sold to Kenny Gesinger, Eagle Butte, S.D., for $2,600. Lot 16, FA Aruba Rebel Cat, a May 2016 bay stallion sired by PC Frosty Drifter x PC Boston Bob going back to Boon Dox John and Sun Frost on the top side and out of a PC Leatherwood x Perky Rebel Cat dam sold to Kenny Gesinger for $2100.